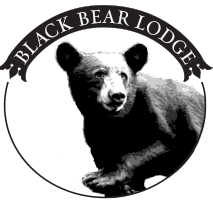 Located in the Blue Ridge Mountains of Western North Carolina, at 3200 feet elevation the Black Bear Lodge offers its guests moderate temperatures throughout the year. The summers are cool, fall and spring delightful, and you may even get a touch of snow in the winter. Conveniently located just off US Hwy 64 (Rosman Hwy) in Sapphire, this is a great place to spend the night or an extended holiday. Cashiers and Brevard are just a short distance away. All of our accommodations are 2 room suites with full kitchens, cozy living area, flat screen TV, wifi, with either king or queen sized beds. Connecting rooms can be requested and we are pet friendly. The proprietors wanted to achieve a true mountain experience with rustically elegant surroundings. A stay at the Black Bear Lodge will prove that they have more than achieved this goal. Please click through all our rooms and see how a stay in the mountains can feel casual and luxurious at the same time.